Today I wanted to explore rose gold, which is still very much in trend this Fall. 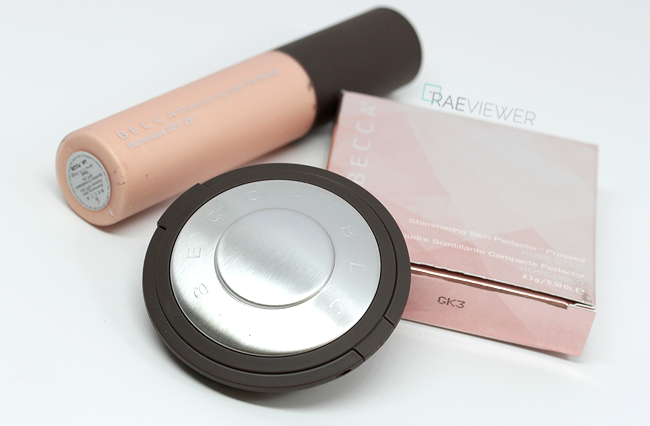 I will focus on Becca's Shimmering Skin Perfector Pressed ($38 USD), a creamy powder luminizer that absorbs and reflects light for a superbly natural glow. The texture of this powder is silky and easy to blend. 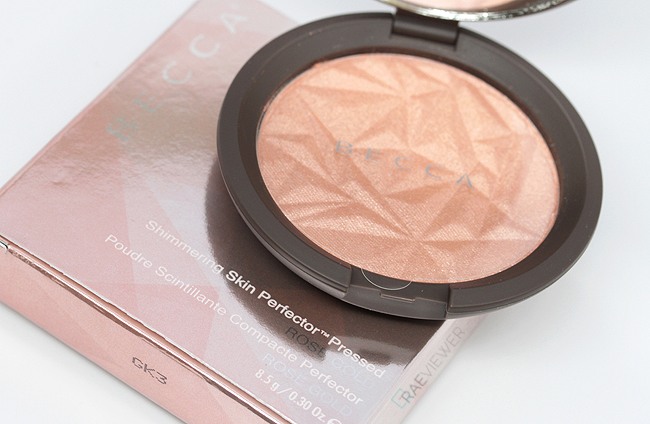 Becca makes some of the most coveted highlighters on the market, so check out the swatches after the jump! This formula, according to the press release, features ultra-fine luminescent pearls that absorb, reflect, and refract light. I like to follow the directions and gently tap a brush into the compact and sweep across the tops of cheekbones. I have even worn it as eyeshadow, with a little matte brown in the crease, for a casual no-brainer look. This buttery smooth powder formula melds even with dry skin for a luminous, flawless glow. The reflective particles make this Rose Gold color photograph differently with each lighting scenario. On my face in sunlight, it looks more like the glowing top corner of the compact in the photo above. When layered heavily like in the swatch photo below, the shimmer is more apparent so less is more in this case. 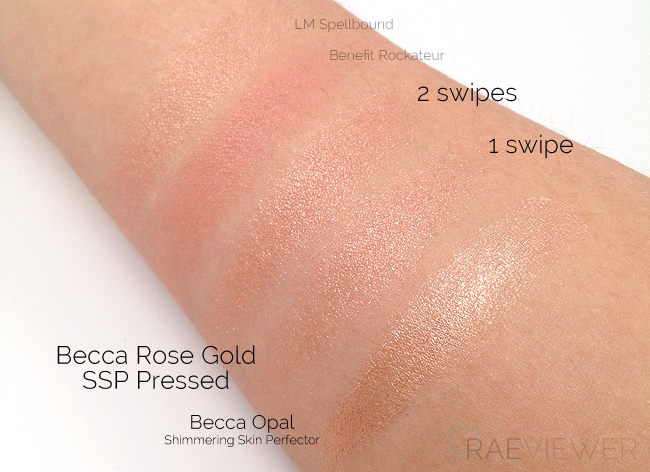 Laura Mercier's Spellbound wears more peach-gold on my face, whereas Becca's Rose Gold is more sheer and a hint more pink. I personally find that Becca's formula is just as easy to control and can be dusted on all the high points of the face for a uniquely warm (but not too far orange or too gold) highlighted effect. 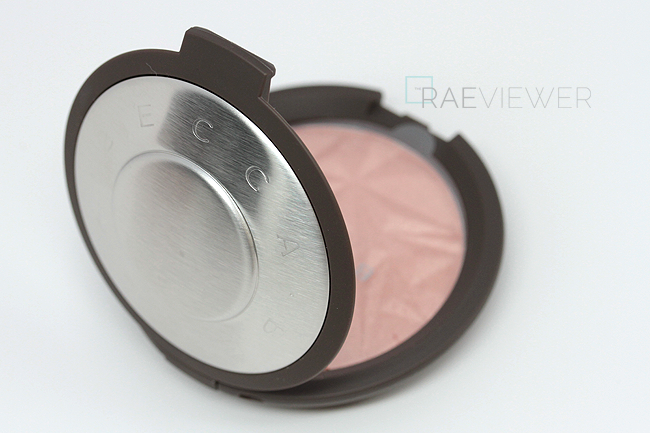 Most rose gold highlighters tend to look more natural on warm skin tones, but the pink in Becca's Perfector Pressed makes it the ideal rose gold shade for all skin colors. 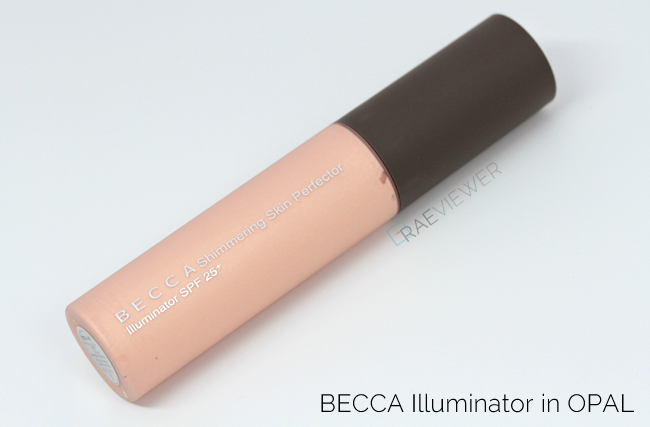 Becca's Opal Shimming Skin Perfector in the original liquid formula has more subtle shimmer particles and is best used as a foundation base/primer or mixed into your favorite liquid foundation. 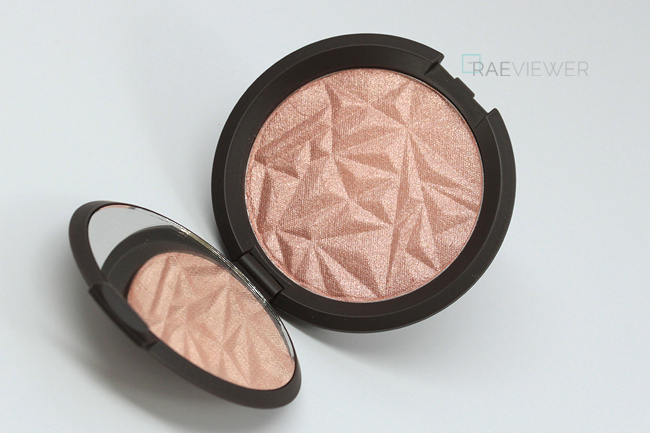 Opal is more champagne-gold than rose gold, so it is actually a closer match to Laura Mercier's Spellbound. If you have very dry skin, I recommend trying the original formula first. 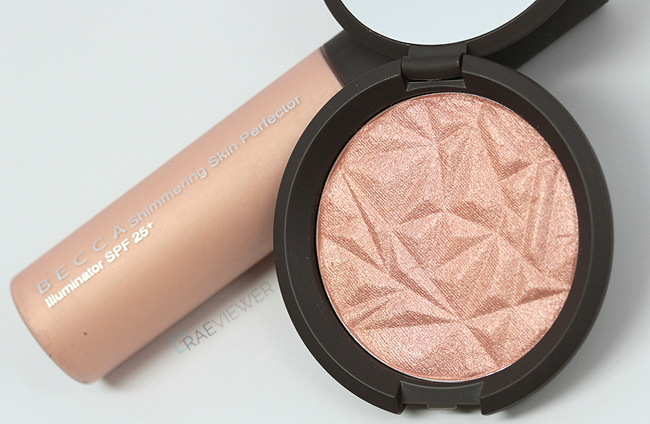 I prefer the Opal for a more subtle , "gleaming" effect, but the Rose Gold Perfector Pressed performs better on a powdered face, which is what I generally sport. 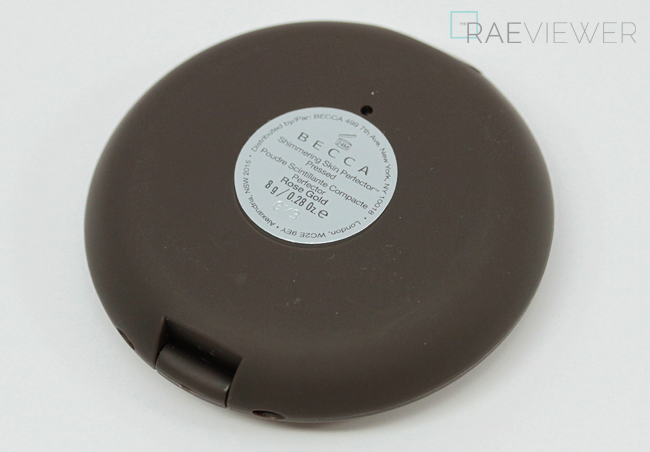 Both are lovely highlighting options and by far the best Becca products I have tried since I fell in love with their Mineral Powder Foundation last year. This product is ideal for those who require a travel version of the original liquid formula or for those with oily skin who prefer powders for longer lasting results. There is no potential slipping or sliding with the Pressed! The powder version does accentuate the look of pores slightly more than the liquid version, but that is only visible when examining the skin closely in a mirror. From a conventional standing or at seated distance, the powder simply provides a natural but beautiful glow. NOTE: Today is the last day of Sephora's VIB Sale! The Pressed Rose Gold version has already sold out on the website, but with the code VIBTOPIA, you can score 20% off the equally pretty Opal or even Moonstone, which is the most traditional of the shades and also the most popular for fair skin tones. Bottom Line: This limited edition Shimmering Skin Perfector Pressed powder is a very sophisticated, soft and feminine take on Rose Gold, so I highly recommend it to all! 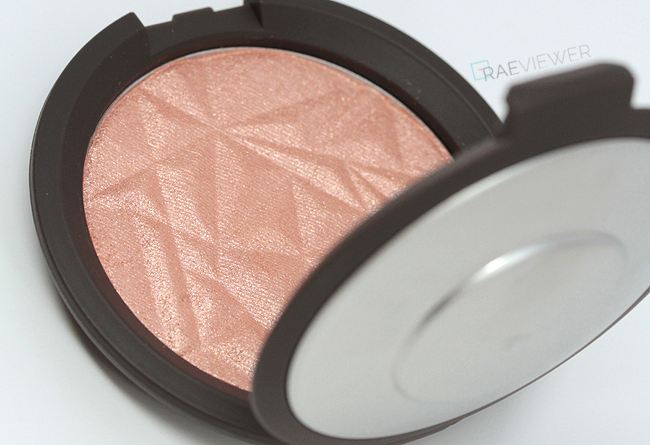 This highlighter looks beautiful! I love Becca's Opal.